12 June 2005, 3:15 pm. Highpoint #27. 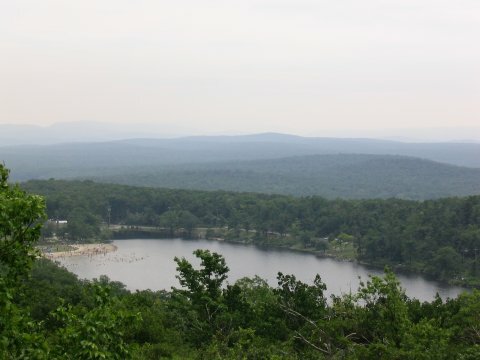 After tagging the Delaware highpoint (as much as it is defined, anyways), I continued on for New Jersey. Heading south on SR 55 from exit 2 on I-84 in New York, I soon passed the New Jersey state line, where the road became SR 519. About half a mile after entering the state, the Appalachian Trail crosses the road, this is where I would begin my hike. There was a parking area on the west side of the road, with an AT sign on the trail, near coordinates N41 19.763 W74 38.591, at 1035 ft. (The trailhead, and the entire hike, is inside High Point State Park.) 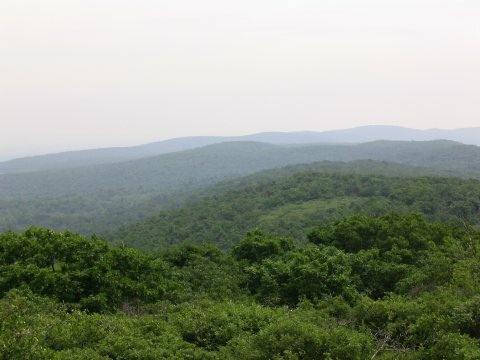 I followed the white blazes of the AT uphill to the west for a quarter mile or so, then south south-west along a mostly level ridge for about a mile, then uphill again, mostly to the west, for around another half mile. 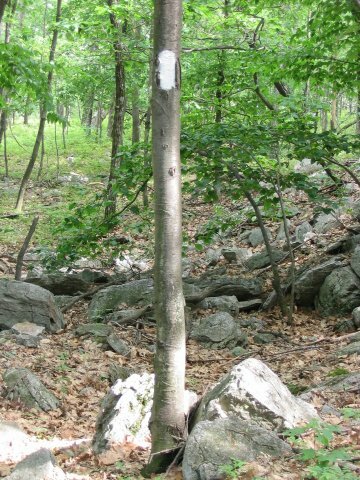 At this point, around coordinates N41 19.111 W74 39.809, near Lake Marcia, the AT joins the Monument Trail, marked with red and green markers, while the AT itself turns south. 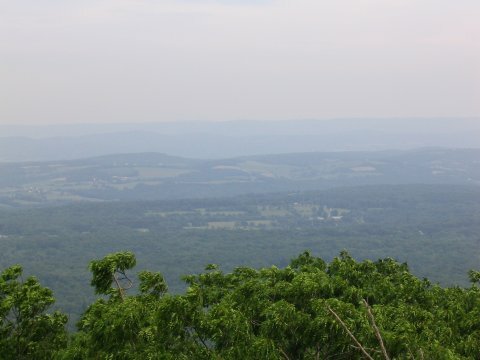 I should have switched onto the Monument Trail here, but instead I continued along the AT for a little while longer, until it became obvious that I was heading away from the high point. I soon found a faint trail that headed down to a road, and followed it north towards the high point. I picked up the Monument Trail soon after, and then followed it to the large tower on the summit. Along the way, I passed three separate hikers, heading the opposite way to me. They were Maine highpointers, a.k.a. Appalachian Trail thru-hikers. They had already walked over one thousand miles from their trailhead, and still had hundreds more to go. I passed three hikers following these white blazes to the highpoint of Maine. After reaching the tower, I went inside and climbed the steps to the top. There are quite a number of steps, more than it looked like from the outside. Unfortunately, the view wasn't that great from the top, there were a few small windows that were kind of cloudy. 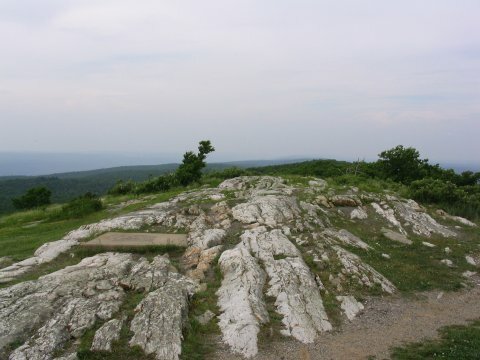 After the long descent down the tower staircase, I headed back to the car, taking the Monument Trail back straight to the Appalachian Trail, the route that I should have followed on the way up. The total distance was around 5 miles RT, with 770 ft of elevation gain. 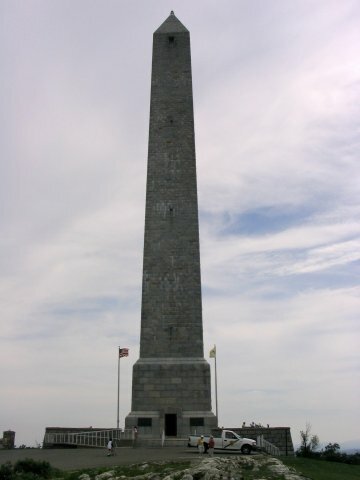 Summit monument, with lots of steps that you can climb. The highest point is in the foreground. This area, just north of the tower, seemed to be the highest ground. 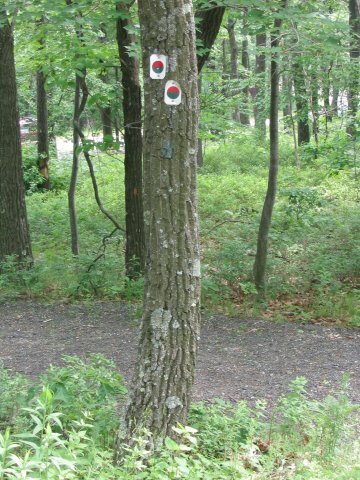 These red and green signs mark the Monument Trail. 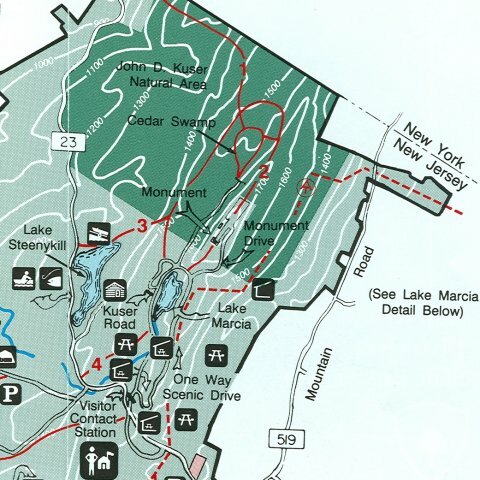 This partial reprint of the State Park map shows my route. I requested these by calling (973) 875-4800.